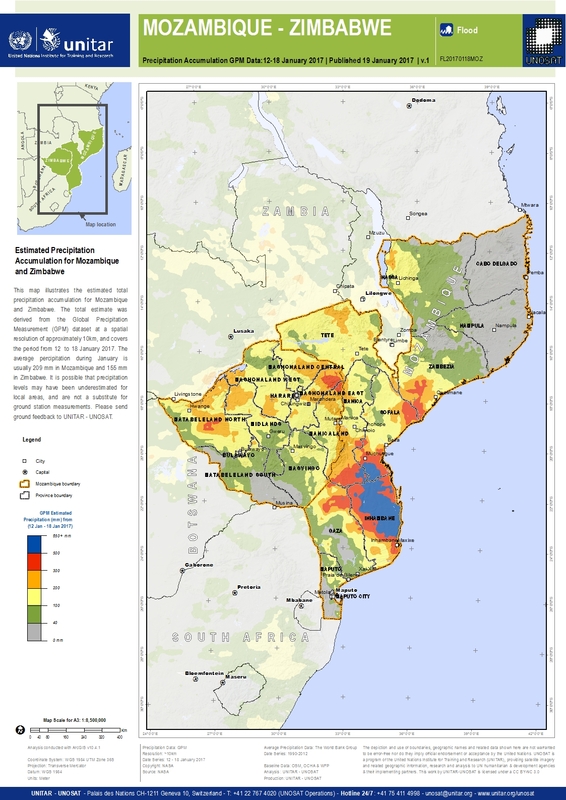 This map illustrates the estimated total precipitation accumulation for Mozambique and Zimbabwe. The total estimate was derived from the Global Precipitation Measurement (GPM) dataset at a spatial resolution of approximately 10km, and covers the period from 12 to 18 January 2017. The average percipitation during January is usually 209 mm in Mozambique and 155 mm in Zimbabwe. It is possible that precipitation levels may have been underestimated for local areas, and are not a substitute for ground station measurements. Please send ground feedback to UNITAR - UNOSAT.